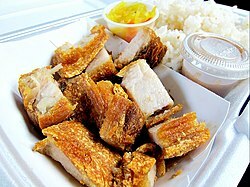 Lechon kawali, also known as lechon carajay, is crispy pork belly deep-fried in a pan or wok (kawali). It is seasoned beforehand, cooked then served chopped into pieces. It is usually accompanied with a lechon sauce such as Mang Tomas or toyomansi (soy sauce with calamansi). If deep fried extensively until crispy and crunchy, it becomes the Ilocano bagnet, a variant of chicharon. Lechon kawali is also a common accompaniment or ingredient to stir-fried water spinach with shrimp paste (binagoongang kangkong). ^ "Lechon Carajay Recipe". Panlasang Pinoy. Retrieved 29 March 2019. ^ "Lechon Kawali". PinoyChow.com - Filipino Food Recipe. ^ Oh, Sam (21 June 2013). "#SamLikesItHot: Kangkong bagoong with lechon kawali". Rappler. Retrieved 21 April 2019. This pork-related article is a stub. You can help Wikipedia by expanding it. This page was last edited on 21 April 2019, at 09:42 (UTC).